Not a full blown cliché but it's one of those things you almost only see in PEPLUM films and wonder how practical it would have been to have such a thing. 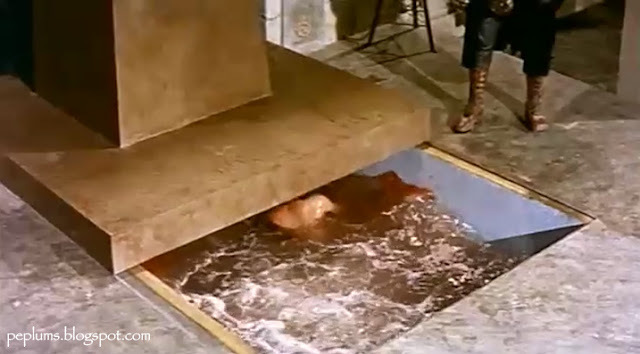 Raf Baldassarre is thrown into a tank filled with acid in HERCULES & THE CAPTIVE WOMEN. In the following shot we see a skeleton in the liquid. In THE SON OF SPARTACUS, a rebel is tossed into a tank filled with deadly fishes (Moray?) which results in the following scene captured below. The tank scenes in the PEP movies were always intriguing. What was in them could be surprising- acid, crocodiles, wild dogs, wolves, lions, snakes, monsters, and anything else they could think of. GREAT FUN!! Lou Ferrigno, the ultimate Hercules?